The World Trade Organisation (WTO) is now set to appoint a new director-general. 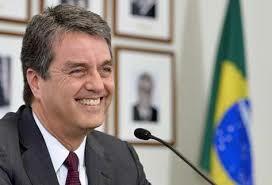 He is Roberto Carvalho de Azevêdo, Brazil’s long-serving ambassador to the organisation. His appointment is good news for developing countries in so far as Carvalho de Azevêdo is from a leading developing country that has shown itself not to be averse to taking on the countries that have dominated the WTO. Those countries are the United States and the collective 27-nation European Union. But, while a WTO director-general from the developing world is to be welcomed, his appointment in itself should not be cause by smaller developing countries – particularly the small states of the Caribbean and the Pacific – to assume that there will be a sea-change in WTO rules and procedures to treat them more fairly. There should also be no rejoicing that the traditional agenda of the US and the EU will be pushed any less strongly. That agenda has a very limited focus, which is to get a narrow agreement easing the movement of goods throughout the world. Having grown their own economies on protectionism from competition and built up their manufacturing and services sector on the back of it, they now want access to the markets of the developing world, in particular China, India and Brazil. The US and the EU are two big players accustomed to getting their own way when they act together. Even when they have rivalries over agricultural subsidies, they have managed in the past to devise a bargain that maintains their advantage over developing countries. Getting movement from them to enlarge the WTO agenda so that, while it advances a broad global trade agenda that improves the flow of goods and services around the world, it also gives developing countries the right to protect and grow local businesses and industries for a period of time that would reasonably make them competitive, will not be easy. And, it should not be assumed that there is harmony in the interests of the large developing countries such as China, India and Brazil with the small states of world. Thus far, in the Doha Round of negotiations at the WTO, small and vulnerable economies have had to fight every inch of the way for concessions that they have won in negotiating committees. It should be understood, however, that while these concessions have been noted, they are not enshrined or implemented. The Doha Round of negotiations is now in its 12th year. The world has witnessed no negotiation of such length that has produced so little. If the sums were done on how much countries have spent on these negotiations, the total figure so far might have made a huge difference to combatting HIV/Aids or non-communicable diseases in very many countries. The Round was supposed to be a “development round” – a recognition that “the majority of WTO members are developing countries” and that there should be efforts to “place their needs and interests at the heart of the work programme”. Small and vulnerable economies, such as those in the Caribbean, have good reason to be disappointed that developed countries have not fulfilled their commitment to place ‘development’ at the centre of the Round. Of course, in the intervening 12 year-period, China, India and Brazil have emerged as powerful economies. China is now the second largest economy in the world; India is third and Brazil seventh. The US has remained the largest single economy, but if the European Union is taken as a single bloc, it would be the world’s top economy at $15.65 trillion. What is significant is that China, India and Brazil have grown significantly without any settlement of the Doha Round negotiations. This fact makes the ‘development’ component of the Round far more important to smaller developing countries that lack population and resources, but they are now caught in the middle of the struggle between the big two – the US and the EU – and the big developing countries China, India and Brazil especially. The negotiations, so far, have also been based on the concept of a “Single Undertaking”, which means that ‘nothing is agreed, until everything is agreed’. Well, the likelihood of everything being agreed was a false ambition from the outset, and its impossibilities are at the root cause of the lack of progress. It is that concept of ‘nothing is agreed, until everything is agreed’ that Carvalho de Azevêdo will have to tackle before he can begin to make a difference to the WTO. Both a different ambition and a different modality of negotiation would have to be agreed. And, if these are agreed, then the arduous task of scrutinising a negotiated text would have to be undertaken to be sure that its clauses can actually deliver on development. Developing countries – and particularly small states – have been parties to many declarations and agreements whose texts have been rich on promises, and poor on delivery. These are huge tasks for Carvalho de Azevêdo, assuming that he holds the view that the negotiation objective and the modalities for negotiation require to be changed. In any event, he will need to hear the voices of small and vulnerable countries, and he will also need them to solicit the support of the larger developing countries and the developed nations in this quest. Over the period of the Doha Round, small and vulnerable economies – including those in the Caribbean – have done very well to participate in the negotiations, albeit the burden has fallen on only a few. Many Caribbean countries individually do not have the resources to deal effectively in the negotiations; others are not represented at all. But, apart from resources at the WTO, Caribbean countries also need a pro-active agenda of forward looking proposals. Such proposals should be devised at a pan-Caribbean level, and they should be advanced by a strong and joint team of WTO-based negotiators providing solid and compelling arguments for their individual country representatives to put forward. The appointment of Carvalho de Azevêdo is an opportunity for Caribbean countries in which they should invest collectively as a region.